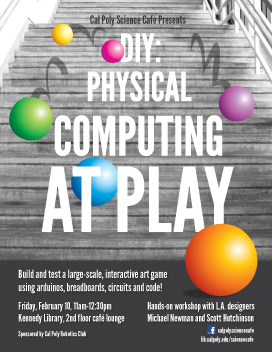 Join us for a morning of making, strategizing and playing as we extend computers into the physical space to create a large-scale, interactive game in the library. Arduinos, breadboards, circuits and code all factor into the equation in this hands-on workshop. Some may even consider it a moving art installation. “No boring lectures,” said Michael Newman, one of the designers presenting the interdisciplinary workshop. “Fun for all levels of experience,” said Scott Hutchinson, graphic designer and co-presenter. Michael Newman is a creative director, interactive developer and teacher, specializing in new media, content creation, product development and creative solutions. He created one of the world’s first Twitter games, and has also worked on a line of interactive pet toys, a slew of API mash-ups and has an extensive background in digital video. He helped develop the digital video portion of the Interactive Program at Pratt Manhattan, where he was a professor from 2001 through 2003. Michael received a BFA from the School of Visual Arts where he focused on oil painting. Scott Hutchinson, designer, is the program director of the Visual Arts at UCLA Extension where he oversees the design, studio, photography, art history and user experience programs. He has an MFA from UCLA’s Design Media Arts program and specializes in usability, branding, social media and web development. Scott is also the user experience and strategic advisor for the UCLA Volunteer Center and organizer of TEDxUCLA. Already Thursday! It's 3:05pm right now.